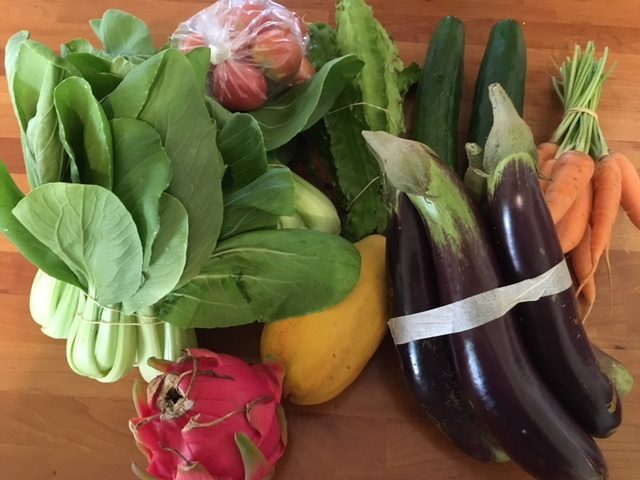 Even though we always go to the Kapaa farmers’ market every week with a list, we can’t or won’t always find what we’re looking for or need. For example, the farmer that always has zucchini has not been at the market the past two weeks, and no one else sells zucchini. Yesterday we wanted to buy mung bean sprouts but the “sprout lady” wasn’t there. Our weekly budget for the market is $20. We used to budget and spend more, but finally figured out we didn’t need so much, and that if we did buy a lot things would often spoil before we could use them. So, we started only bringing $20 with us each week, which has been more than enough. Whatever is leftover each week from the $20 goes into our change/$1 bill jar. Last week we were able to find everything we wanted, but yesterday we had to get a bit more creative as many farmers were no-shows for some reason. Still, we made some great finds and got some great deals. This is a pretty typical shop for us. We bought most of it from one farmer, who gave us the winged beans as a thank you. The dragonfruit and papaya were purchased from other farmers – we always check around to find the best price when we buy fruit because it’s pretty much all the same. The old woman at the stand where we bought the pumpkin tried to charge $5 for it, but her son walked over and told us it was just $4.00 (like it said on the sign). 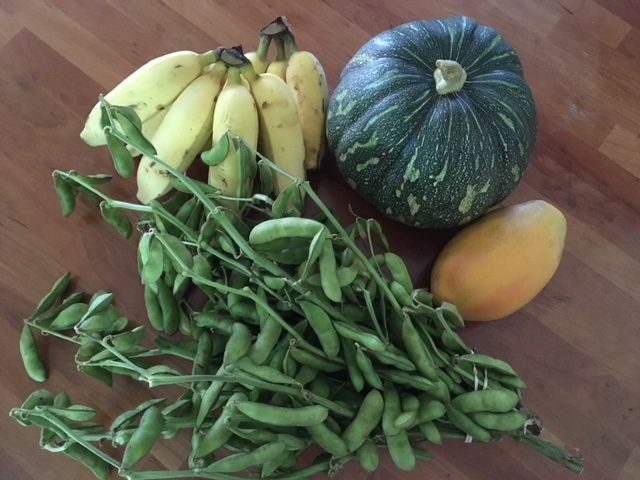 The fresh edamame was a surprise – very few farmers grow it here. The farmer yesterday told us her friend had given her some seeds a few years ago and now the edamame was growing like crazy! Five dollars for as much as we got was a steal. We’ll have some along with the grilled teriyaki chicken and simmered pumpkin this week, and the rest will be for snacks. We were disappointed that the “sprout lady” wasn’t there because we need mung beans for Sunday’s dinner, but we will stop by Big Save on Saturday and pick some up there. They’re the same price, but we like buying directly from the farmer. Wow, that’s a lot of food for $20! I saw the picture of the edamame and couldn’t figure out what it was. I’ve never seen it before. Does it taste similar to frozen edamame? I almost didn’t recognize the edamame when I first saw it, and couldn’t believe I could get that much for just $5. Fresh edamame is so much better than frozen. I’ve always boiled it before but the farmer told me to try it in the microwave, so I did. Much easier and faster, and it came out perfectly! Yum! I’m going to look for fresh edamame at Whole Foods. I rarely shop there but it would be a fun find.